Posted by thetickthatbitme in Choline Diet, Tick-Lit, Whole Person. In the past, my choline diet posts have been mostly geared towards omnivores, as eating eggs and meat is an easy way to get one’s daily dose of choline. If you’re new to this blog–or just forgetful–I’ve been on a choline-rich diet since I started getting treated for Borrelia hermsii and Anaplasmosis last year. My doctor recommended this because I had some neurological involvement with my illness–brain fog, chronic fatigue, arthralgias–and there’s research that suggests that eating choline helps our bodies produce more of the neurotransmitter acetylcholine. 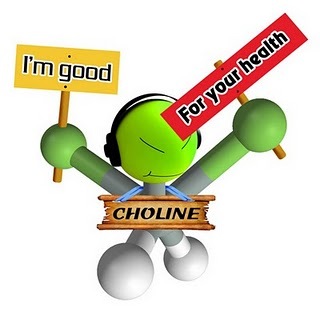 Choline has also been linked to lower levels of inflammation. In addition, choline is particularly important for pregnant women, as higher choline intake during pregnancy is associated with a lower risk of neural tube defects in infants. So that’s why I’m always telling my readers to eat their eggs and meat and green veggies. However, since a study led by Scott Commins at the University of Virginia linking lone star tick bites to red meat allergies gained national media attention (ABC, CNN) a few weeks ago, I’ve been thinking about how to make my choline recipe recommendations more herbivore-friendly. I hope these lists get you on your way to a diet more rich in choline, whether it includes meat or not. This concludes the herbivore section of this post. If you don’t want to be tempted with any meat, try clicking over to some of my other posts. If you’re here in search of choline diet inspiration of the omnivore variety, I haven’t completely forgotten you. Here’s a glimpse of what I had for lunch. 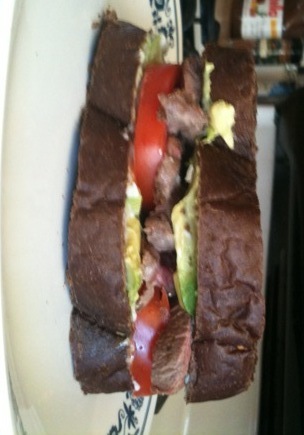 Steak sandwich on pumpernickel with avocado and tomato. Happy Sunday, everybody! And watch out for ticks!